Much of the tactical combat in Phoenix Point takes place within human controlled Havens. These will not be the only places where combat occurs. There will be scavenging sites, your own bases to defend and enemy bases to attack, where the Pandoravirus mutates and grows its reinforcements. Finding and destroying these aliens lairs will be fundamental to your success in the game. 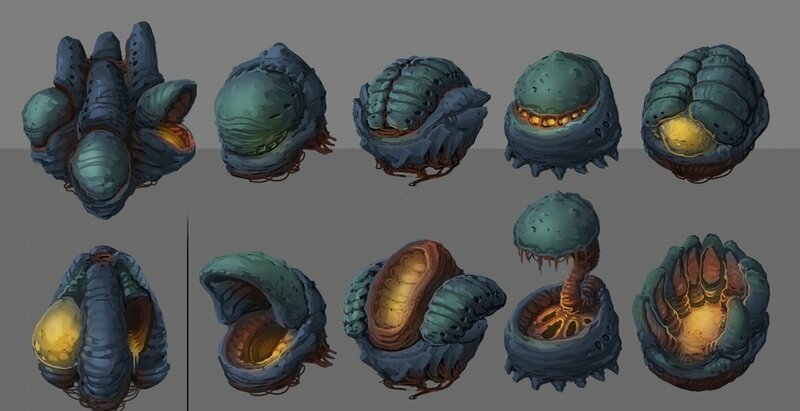 One of the main design goals for these enemy bases was to give them an organic appearance. There are three main differences with the enemy bases to make them feel more organic and less “man-made”. We’ve tried to avoid making the maps square. This gives more opportunity to build maze-like environments where you will have different options for taking cover, breaking line of sight and flanking your enemies. We want the maps have a more “indoor” feeling to them. While some of them will still technically be outdoor maps, the claustrophobic feeling remains the same. Adding to the first point, this allows for more winding and twisting corridors. We have made all of the props and features in the maps organic. We want to remove as many man-made elements as possible from the Pandoravirus environments. Many things which are required mechanically for your units to interact with (such as ladders) need to be reworked to be more organic. The approach we decided to take for things such as ladders and walls, was to use the remains of other creatures. Above, you can see a variety of different creature spines and carapaces which can be placed as ladders. Having a variety is also important. Having multiple copies of an identical ladder is a man-made environment is fine - but in an attempt to keep things looking organic and “natural”, we wanted to try and avoid some repetition. The Pandoravirus ladders also need to keep regular spacing and dimensions so that they will all still work with the climbing animations (it wouldn’t be efficient to require separate climbing animations for different ladder types). In addition, we need different variations depending on height (1 floor, 2 floors etc). With a ladder you can just extend it and add extra rungs. That doesn’t work quite so well with a spine! As you can see above, we can vary the ladder length, keeping rungs the same distance apart to work with the climbing animations. In keeping with the organic theme, many of the walls and items that can be used as cover are also the remains (or possibly living!) creatures. Keeping them modular allows more mid-segments to extend them to any length needed. There will also be a number of different walkways, ramps and bridges. Even though Pandoravirus maps will have an indoor feel, they will still play on multiple levels where you can use height to your advantage. 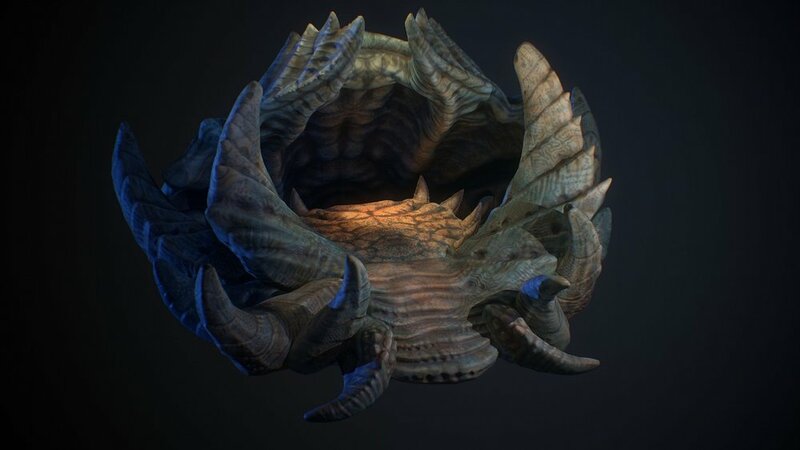 As the Pandoravirus has a semi-aquatic theme, many of the detail elements around the enemy bases take inspiration from corals and sea-creatures. Just like Havens, you will also find supply crates in enemy bases containing useful items and resources. Of course, a metal supply crate would look out of place. Above you can see some of the concept variations for the organic crates. Above is one of the enemy structures. We’re not going to say what this one is, or exactly what its purpose is at this point. 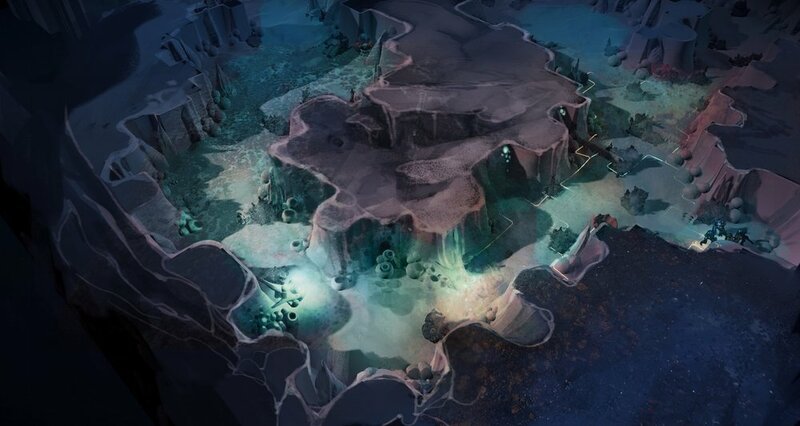 Unlike the buildings found in Havens (which make up parts of the map and have explorable interiors), the Pandoravirus structures are standalone objects on the map which serve various functions. Some mission objectives will require you to find and destroy them. Finally, we can show an example layout of a possible Pandoravirus map. Like all maps, they will be procedurally generated, which can lead to more of a technical challenge as they do not conform to square map plots. Each element of the map still has to align with the grid system for movement. We will be showing more of the Pandoravirus assets in a future update.